Wales will always be known for its beautiful countryside. It can be seen clearly in this panorama for college. When you're college shopping, be on the lookout for college items that will bring character and fun to your college dorm room. Panoramas for college will do just that! They're more majestic and downright cooler decorations for college than everyday, cheap posters. So if you want to bring a unique touch to your wall decor for college, add a panorama. This aerial photograph of Cardiff was taken by James Blakeway. 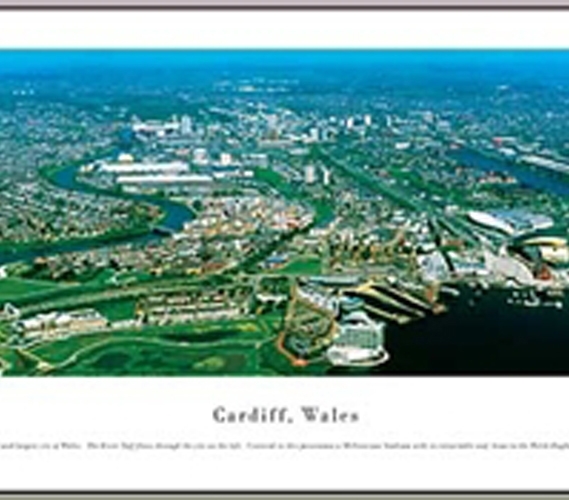 Cardiff is the capital and largest city of Wales. 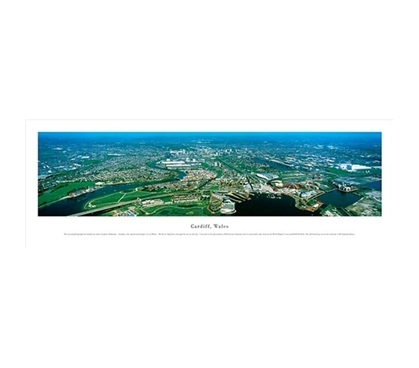 The River Taff flows through the city on the left. Centered in this panorama is Millennium Stadium with its retractable roof, home to the Welsh Rugby Union and FAW Football. The tall building next to the stadium is BT Stadium House. The white building standing on the Cardiff Bay waterfront is the 5-star St David’s Hotel and Spa. To its right, the luminescent slope-roofed building is Wales Millennium Centre, a premier performing arts venue. Cardiff was a prosperous coal shipping port in the 19th and early 20th Centuries.